Here is the 7’7″ unit and the stackable unit, available in Oak, Maple or Cherry. The Cat’s Inn carries a variety of different cat townhouses to accommodate a wide range of needs. From shelters to clinics to breeders and groomers, the needs of each cat-related business are unique, and the solutions available from The Cat’s Inn are adaptable to meet those requirements individually. The classic townhouse design stands 7-foot-7 in height, and offers cats six levels to explore from top to bottom. Featuring a secluded litter box area at the bottom, cats can climb up and down to get different perspectives or to find space away from their housemates. Constructed with thermally fused, commercial-grade melamine interiors, each unit is simple to clean and resistant to scratches. Available in a range of colors and three exterior designs – oak, cherry or maple hardwood, oak or maple wood and melamine and medex – each unit can accommodate three adult cats comfortably. The stackable design offers many of the same features in a more compact design that’s well suited to environments with a limited space or businesses that are growing. Featuring four levels, these units stand 45.5 inches in height and also offer a combination of secluded areas and elevated open space with clear lines of sight. Available in the same range of colors and exteriors as the full-sized townhouses, the stackable design stands accommodates a single cat. Last, the specially designed animal shelter series is available in two distinct designs. 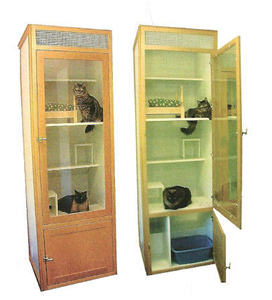 The 4001 model stands 5.5 feet in height and offers three areas for cats – one cat per unit – with vents located at the top and bottom of each unit’s door. As with the other units, a secluded area offers cats private litter box access, while maintaining a play and lounging area for cats to relax. The 4003 series replaces the bottom space with storage for extra litter, food or other personal items for each cat, with two units above that can each accommodate two cats. These units are constructed with medium-density fiberboard paneled exteriors and melamine interiors, and are mounted on lockable swivel caster wheels, allowing them to be easily placed or moved wherever is most convenient. Read more about each townhouse online, or give The Cat’s Inn a call at 877-228-7466 to learn more or to receive a quote today. Total of 14 square feet of flat living space.